Marji LaFreniere has always loved colors and making things. In 1988 she bought 'Yarncrafts', then located at Simsburytown Shops and changed the name to ‘Marji’s Yarncrafts’. Later Marji moved her store to her 150-year-old historic home on Salmon Brook Road where she is 'til this day. With the store attached to her home she has been able to do what she loves while raising her three kids and watching them grow. Marji loves living in a small community where everyone knows your name and enjoys welcoming new people in to the shop. Marji has a natural aptitude for math and engineering which came in handy while creating her own line of knitting patterns. 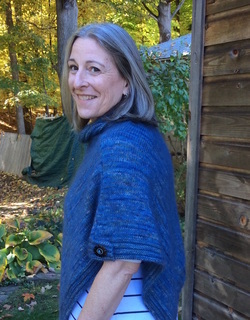 Marji’s designs have been published in publications such as Interweave Knits, Koigu Magazine, Knitter’s Stash (Interweave 2004), One-Skein Wonders (Storey, 2006), Sock Yarn One-Skein Wonders (Storey, 2010) and used by Berroco and Cascade.